Name: Casey Janine Huinui Albury. 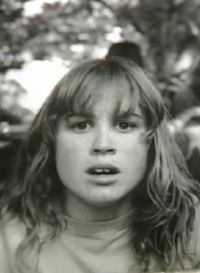 Casey was killed by her mother, who initially took her to a bridge in the hopes that Casey would climb onto it and fall off. When Casey refused, she took her daughter into an alley and strangled her. Perpetrator: Janine Albury-Thomson (Mother). Convicted of manslaughter; sentenced to four years; served 15 months. Location: El Cerrito, California, USA. Disability: Mobility impairment due to obesity; possible Prader-Willi syndrome. Because Christina was gaining weight, her mother took her out of school. Her mother left her on the living room floor and did not take her to see a doctor. Christina gained so much weight that she could not walk, and died from heart failure. She had been badly neglected and was covered with bedsores. Perpetrator: Marlene Corrigan (Mother), convicted of misdemeanor child abuse, sentenced to 3 years probation. Ryan’s mother took him to the garage and poisoned him and herself with exhaust fumes. He died only 19 days after the verdict in the Tracy Latimer murder trial. Tracy’s father put her in his truck, connected the exhaust to the cab, and poisoned her with carbon monoxide. Media coverage of Tracy’s death, which tended to support her killer, may have sparked several copycat crimes. Perpetrator: Robert Latimer (Father). Second degree murder; sentenced to life; paroled after 9 years, 11 months. Josiah was smothered by his older brother. Perpetrator: Parents Kathleen and Timothy Carroll, brother James Carroll. The crime was witnessed by Josiah’s brother Isaiah, but his testimony was not considered because he is non-verbal and communicates by pointing. Name: Unknown; last name may be Lev. This teenage boy was poisoned by his mother. Name: Dr. Malanie Desilva Paul. Dr. Malanie Paul, her 17-year-old daughter Medhini, and her son Anthony Rajiva were killed by her husband, also a doctor, who sedated his family and then attached them and himself to IVs full of poison. Apparently, he had decided that there was “no alternative to death” for his disabled wife and daughter, and had killed twelve-year-old Anthony too because he feared that the boy would enter the foster care system and become “a freak”. Perpetrator: Anthony R. Paul (Husband/Father). Neglected by her mother, Rishonda died of starvation and infected bedsores. She was an honor student who liked to write poetry and short stories. 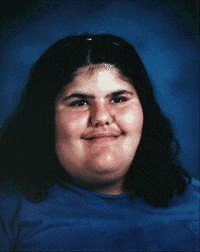 Perpetrator: Michelle Jones (Mother); charged with manslaughter and child cruelty. Name: Dominic J. 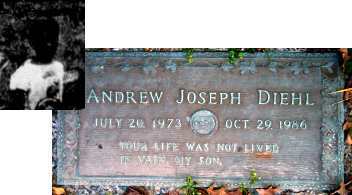 “Andrew” Diehl. Location: Virginia Beach, Virginia, USA. Disability: Child abuse survivor; emotionally disturbed. 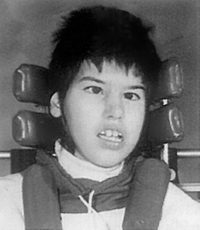 Andrew died of head injuries inflicted by his adoptive father; he was tied to the floor of the family bus and severely beaten. Andrew liked to read Western novels. Perpetrator: Michael Diehl (Adoptive father), first-degree murder, 41 years; Karen Diehl (Adoptive mother), manslaughter, 31 years.